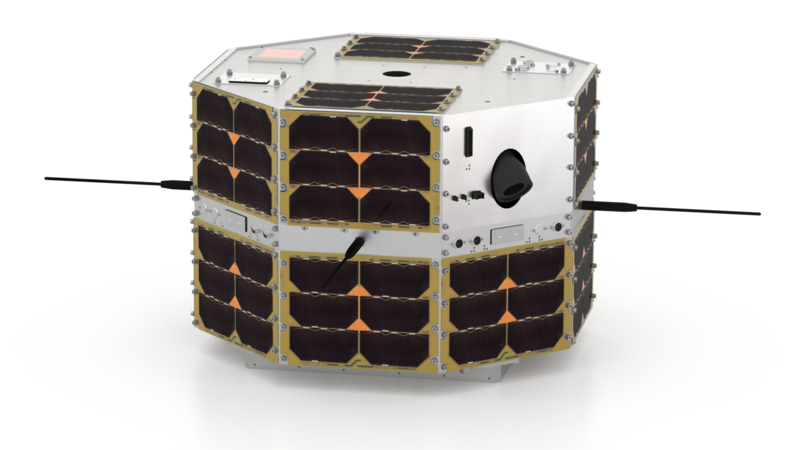 The TechnoSat project, which is funded by the German Aerospace Center (DLR), aims to design, build and launch a nanosatellite. Primary mission objective of the TechnoSat mission is the demonstration and verification of newly designed components and subsystems for nanosatellites. The secondary mission objective is the design and operation of the adaptive and reusable nanosatellite platform TUBiX20. The adaptivity implies in this case that the platform can be adjusted to different payloads, orbits and mission scenarios. TechnoSat itself has a mass of approximately 20 kg and measures about 305 x 465 x 465 mm without antennas. TechnoSat was launched as the 12th satellite of Technische Universität Berlin on a Russian Soyuz 2.1 rocket on Friday, July the 14th at 8:36 am Central European Summer Time into an 600 km Sun synchronous orbit. After successful launch, the satellite's beacon as well as first telemetry was received during the first pass over the ground station in Berlin. Currently, experiments are successfully conducted with the payloads on a regular basis. Current activities will be announced on the News page of the Chair of Space Technologies of Technische Universität Berlin. The fluid-dynamic actuator (FDA) is a novel attitude actuator for small satellites. The technology has been developed at the Technische Universität Berlin and is based on the principle of angular momentum storage using liquid metal. In contrast to reaction wheels, no mechanically movable components are used for fluid-dynamic actuators so that they are characterized by high resistance to shocks and are practically free of abrasion. Moreover, these actuators provide high torques at comparatively low power consumption due to the use of electromagnetic pumps. In the framework of the TechnoSat mission, attitude control properties of a liquid metal actuator are examined in orbit for the first time. Status of the experiment: Experiments with the FDA are successfully performed on a regular basis. After a half year of in-orbit operation, the FDA shows no recognizable degeneration. HiSPiCO is a transmitter system for S band communication links from small satellites to ground developed by IQ wireless GmbH in cooperation with Technische Universität Berlin. The wideband downlink system provides 1 Mbps net data rate with a transmission power of 27 dBm at 5 W power consumption. These technical parameters can be adapted to various requirements by project specific firmware configurations. The HiSPiCO transmitter onboard of TechnoSat is interfaced to a patch antenna with an opening angle of 85° and 6 dBi gain. It is tested by either downlinking test-patterns or pictures to the ground for analysis. Status of the experiment: The S band transmitter is successfully operated on a regular basis. Laser-Retroreflectors are implemented on satellites to enable high-precision range measurements. To this end, lasers on the ground are aimed at the satellite and the time required for the laser pulse to travel to the satellite and back again is measured. Usually, reflectors for laser ranging used on satellites are specially developed. The presented experiment on TechnoSat shall verify the suitability of cost-effective, commercial reflectors for laser ranging on small satellites. The experiment consists of 14 Laser-Retroreflectors distributed over the satellites outer surface each with a diameter of 10 mm. Before integration the reflectors have been characterised by the Helmholtz-Zentrum Potsdam - GFZ German Research Centre for Geosciences. Range measurements are carried out by the International Laser Ranging Service through various stations all over the world while the German Space Operations Center (GSOC) performs satellite orbit determination and propagation based on the distance information. The obtained laser ranging data are moreover used for studies regarding attitude changes of the spacecraft, which are executed by the Austrian Academy of Sciences (ÖAW). Status of the experiment: TechnoSat was tracked for the first time on the 30th of July 2017 by an Australian station. As of January 2018 the distance has been measured in more than 450 passes by 16 different stations (cf. http://edc.dgfi.tum.de/en/satellites/technosat). We sincerely thank all stations for their support! SOLID (SOLar generator based Impact Detector, ℗DE102012000260, ℗US8593165B2), the method developed at DLR Bremen enables the detection of Space Debris and Micrometeoroids by utilizing existing sub systems of a satellite. Compared to known in-situ systems and concepts, SOLID offers a number of advantages, such as: unambiguous identification of impacts, additional sensor structure is not required (utilization of satellite solar panel structure), long on-orbit operational time (sensor operational time only limited by the satellite's on-orbit time), very large sensor detection area (utilizing of various satellites in different orbits). The long-term goal is to provide measurement data for the environmental models like MASTER (ESA) or ORDEM (NASA), to enable the validation and standardization of such models. Standardized simulation models help the satellite designers to optimize their systems for future Earth and interplanetary missions. Furthermore, the knowledge helps to improve Space-Debris-Mitigation measures. The first on-orbit technology demonstration of the SOLID detection system is realized on TechnoSat mission of Technische Universität Berlin. Status of the Experiment: The SOLID sensor is operating continuously. The STELLA project of the University of Würzburg dealt with the development and qualification of a miniature star tracker for pico and nano satellites. STELLA fulfills all relevant boundary conditions and requirements of pico and nano satellites: dimension, mass, power consumption. Overall configuration and performance parameters such as accuracy are tailored such that they are suitable for the pico and nano satellite class, including the cost point of view. The project was funded by the Federal Ministry of Economics and Technology (BMWi) through the Space Administration of the German Aerospace Center (DLR) under grant number 50RM0901. Status of the experiment: STELLA was activated for the first time on the 9th of September 2017. The sensor is under test since then in low Earth orbit. The reaction wheel system consists of four single units, each with dimensions of 65x65x55 mm3 and a weight of 315 g each, that are arranged in a tetrahedron configuration. Each wheel has two mechanical interfaces for flexible integration and one power and data interface unified in a single connector. Up to five different control modes can be selected, e.g. traditional ones like the motor speed mode and the motor ramp (torque) mode or (due to an integrated gyroscope) some special modes like the satellite speed mode. The housing is sealed and pressurized for a better thermal behavior, which also allows using of COTS lubricants for the motor’s ball bearings. Status of the experiment: The reaction wheel system is successfully operated on a regular basis within the attitude control loop of the satellite. The CMOS camera used on TechnoSat is a commercial off-the-shelf (COTS) product that has been modified for the application in space. The sensor was combined with a 23 mm lens (f/4 aperture). The resolution is 640x480 pixels at a ground pixel resolution of 147 m. Thus the camera achieves a swath width of 94 km. The camera was included in the mission to generate payload data for the S band transmitter HiSPiCO and is used for the verification of the attitude control system of TechnoSat. Status of the experiment: The camera is successfully operated on a regular basis.